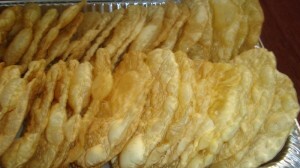 If you have eaten at an Indian Restaurant, you may have had crispi spicy thin cracker like snack -Papodams ( also known as Papad in India)as an apitizer. Papodams are among the popular snacks in Indian Cuissine-some are spicy and some not spicy. The process for making Papodams is very time cconsuming and difficult. Generally these Papodams are made by ladies in many organizations to help women giving special jobs. Many stores carry variety of them. These Papodams are made from Urid daal or Moong Daal or Rice. Flour is made from one of these daals, then dough is made using hot water, Oil, salt and some sort of cooking soda. The dough then is pounded, softened and made in to balls. These balls are flattened and rolled thin and then sun dried. Spices are added while making the dough. These dried flat Papodams are then packed. These packets are available in Indian and other stores. Papodams can be roasted on flame or deep fried. They also can be roasted in Toaster Oven or Microwave. Times vary depending up on the method used. 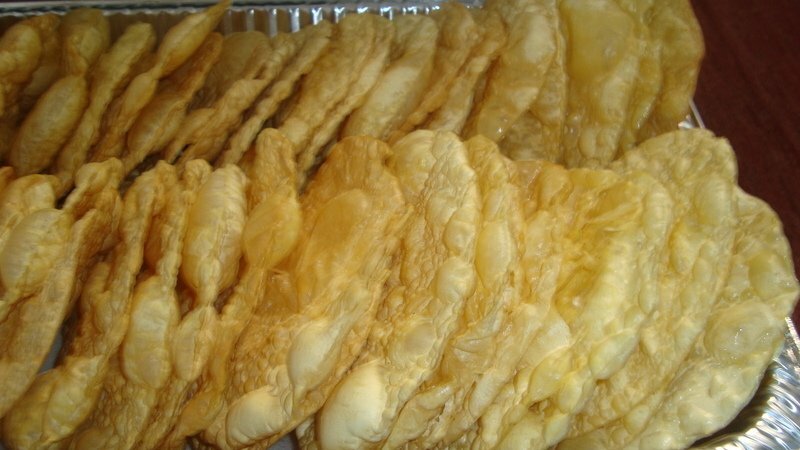 The method for frying and roasting is covered in snack chapter. If you have never roasted Papodams before, you may want to use microwave or deep fry them-roasting on flame requires special handling. For Microwave roasting, it may take a little practice as to how long to cook. It only takes a few seconds to a minute, depending the type of Microwave but, first few times it tkaes careful watching. Try putting a dry store bought Papodam-single piece on a a plate and turn on microwave for 30 seconds. check it and redo the process. papodam will be bubbled and would have changed thew color. For deep frying, you may break up the Papodams -fry them in hot oil and almost instantly take them out. Drain on paper towel to abssorb oil.